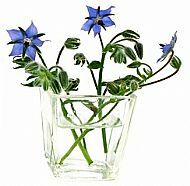 b o r a g e . . .
Borage, an annual, is very easy to grow and will self seed, providing a wonderful supply of pretty, star-shaped, deep blue flowers and delicate leaves, both of which have a cucumber taste, to use for decorating drinks as well as enhancing fruit and leafy salads. It prefers a sunny, sheltered spot and well-drained soil and makes an attractive plant when grown in a pot on the patio. Sow: your borage seeds direct, in shallow drills, as soon as the risk of frost has passed until around the end of July. Alternatively, sow in pots from April and lightly cover with a sprinkling of compost or vermiculite. Aftercare: Thin to around 20cm apart when seedlings are large enough to handle and water in dry conditions. Harvest: by gently tugging on the flowers. Collect the dried seeds from the faded flowers if you do not want to encourage self-seeding. Dunk the pretty flowers in your summer drinks, or preserve them by freezing in individual ice cubes. The edible flowers of borage are also attractive scattered over salads along with the leaves, with their delicate cucumber flavour. Borage will also encourage beneficial insects to visit your garden. CAUTION: Borage flowers should not be eaten in large quantities as they can have a diuretic effect. They should not be consumed by pregnant and nursing women.